Sturgis, South Dakota, March 21, 2017 - Headlined by a local legend, global icons and a couple of go-fast guys who became industry leaders, the Sturgis Motorcycle Museum is honored to present the Sturgis Hall Of Fame Class of 2017. Intended to recognize those individuals who have made a long-term positive impact on the motorcycle community, the Class of 2017 features a group of over achievers and true leaders who have influenced an entire era of motorcycling. Held in conjunction with the annual rally, the Hall Of Fame Induction ceremony is set for August 9, 2017. 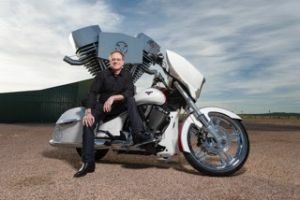 "We have movers and shakers like drag racing legend-turned exhaust icon Terry Vance to the man who literally tooled up the motorcycle industry, JIMS® founder Jim Thiessen," says Myrick Robbins, Executive Director for the Sturgis Motorcycle Museum & Hall Of Fame. "The go-faster guys are joined by clutch performers Colleen Barnett and Mike Taylor on the industry side. World class customizers Cory Ness and Mark Shadley who have shaped how the world views what a motorcycle looks like make for a balanced group of inductees. Leading the Class Of 2017 is the man who brought rock and roll to the annual Sturgis Rally and put the legendary Buffalo Chip on the map, Rod Woodruff. "The J.C. 'Pappy' Hoel Outstanding Achievement Award is a special designation reserved for individuals who have played a special role in the founding, maintaining and/or promoting of the Sturgis Motorcycle Museum & Hall of Fame," explains Robbins. "In addition to everything Rod has done for the rally and the Black Hills region over the years, he has been a member of the Museum's board of directors and helped guide the Hall Of Fame since the beginning." Since 1981, the Sturgis Buffalo Chip Campground has treated millions of motorcyclists to rock concerts, camping, entertainment and more, he adds. "Rod is a real life rock star and a truly deserving recipient of the Pappy Hoel Outstanding Achievement Award." Colleen Barnett & Mike Taylor - Colleen Barnett-Taylor started her motorsports career at Barnett Clutches & Cables while still in her childhood working for her parents (and original 1948 founders), Charlie and Afton Barnett. Since the beginning Colleen has been a driving force and integral part of the company. Mike Taylor, already a long-time motorcycle rider/enthusiast, joined the firm in 1968 which cemented a great partnership after he and Colleen were married. Together they have operated Barnett since 1975 and owned the company since 1993. Cory Ness - Don't think for a second that Cory Ness rode his famous father's coattails into the Sturgis Hall Of Fame. At only 10 years old, he disassembled his bicycle, painted it, chromed its parts and entered it in the Oakland Roadster Show. The first motorcycle he turned his talents to was a wrecked CB350. After building it back up, Cory sold it before even getting a chance to ride it. He was 14! Today Cory is the chief designer behind Arlen Ness Enterprises where he runs the day-to-day business. In between designing new parts and accessories, he still finds time to wrench on custom bikes periodically. Mark Shadley - Since the early 1970s Mark Shadley and Shadley Bros. Motorcycles have been shaping the perception of what a custom motorcycle is. The quality, detail and innovation of his custom built bikes have made him well recognized by both the motorcycle industry and his peers. His enthusiasm and involvement in the custom motorcycle industry has been a lifelong passion. Jim Thiessen - For 50 years, machinist and go-fast guy Jim Thiessen has generated trust with riders, record breakers, racers and certified Harley mechanics around the world whom use JIMS® products on a daily basis. Today JIMS® is one of the industry's leading producers of performance parts, accessories, tools, transmissions and high-performance engines - all aimed at enhancing the Harley rider's experience. Terry Vance - #35 on the NHRA's 50 greatest drag racers of all-time, 14-time national champ Terry Vance never lets off the gas! Terry and his tuner Byron Hines shared a passion for the quarter mile from the early days, but they also shared a vision of creating a company that would be a pillar of the motorcycle aftermarket, and they used their unrivaled achievements in racing to build a brand that would unmistakably stand for quality and performance. Rod Woodruff - Since 1981. the Sturgis Buffalo Chip Campground has treated millions of motorcyclists to rock concerts, camping, entertainment and more. Rod Woodruff is the man who brought Rock & Roll to the Black Hills and now hosts a 10-day Concert Series each August during the annual Sturgis Motorcycle Rally. The Buffalo Chip provides a music festival, various other forms of entertainment, and full service tent, RV and cabin camping on almost 600 acres in rural Meade County. About The Museum: The Sturgis Motorcycle Museum & Hall of Fame's mission is to collect, preserve and interpret the history of motorcycling; honor those who have made a positive and significant impact on the sport and lifestyle; and pay tribute to the heritage of the Sturgis Rally. Our vision is to continue as a world-class museum offering comprehensive and educational exhibits and showcasing rare and unusual motorcycles significant to our history and our sport. The Sturgis Motorcycle Museum & Hall of Fame stands out because of the fact that we not only document the history of the machines, we document the history of the people who have shaped and changed the sport and lifestyle. This will be a resource and inspiration for future generations. Honor the Ride... Build the Legacy! About Strider Sports International, Inc.: Founded in 2007 and headquartered in Rapid City, SD, Strider Sports designs efficient, no-pedal balance bikes for children as young as 18 months, as well as for older riders with special needs. Strider No-Pedal Balance Bikes are industry-leading training bikes that help children as young as 18 months learn to ride effectively on two wheels. Strider also manufactures balance bikes for individuals with special needs and for seniors wanting to stay active later in life. The patented Strider Balance Bikes focus on the fundamentals of balancing, leaning, and steering without the distractions and complications of pedals or training wheels. Strider Bikes are now distributed in more than 75 countries worldwide. In 2017, Strider formed the Strider Education Foundation. To learn more visit www.StriderBikes.com, like them on Facebook, and follow them on Instagram.